2016 B&O Winter Market - Carmichael Inc.
Getting cabin fever and need to get out and have some fun while we wait for spring to get here? Well then, you can join us at the 2016 B&O Winter Market on Saturday Feb 13 from 11-5 pm AND take care of getting your sweetheart something special for Valentine’s Day all in one place. Adult beverages are available for those of you who like to sip and browse, and the ambiance provided by the old train station can’t be beat for an artists’ market. 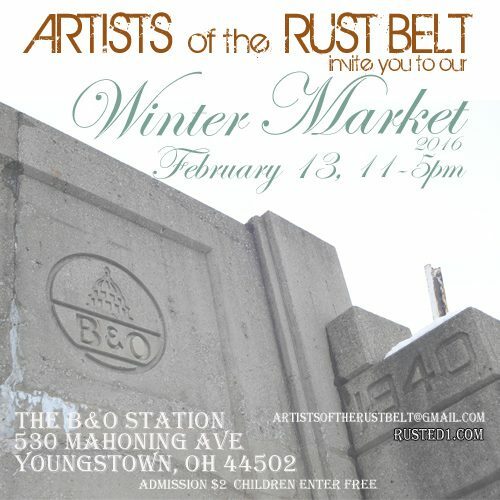 Don’t forget that “Artists of the Rustbelt“ is all about local artists and that all of their merchandise must be authentic. The event organizers do an outstanding job of putting together a show that features a variety of artistic mediums that are affordable for the average person. The B&O also has ample parking, so don’t let a little bit of snow keep you away. Happy Valentine’s Day ! !